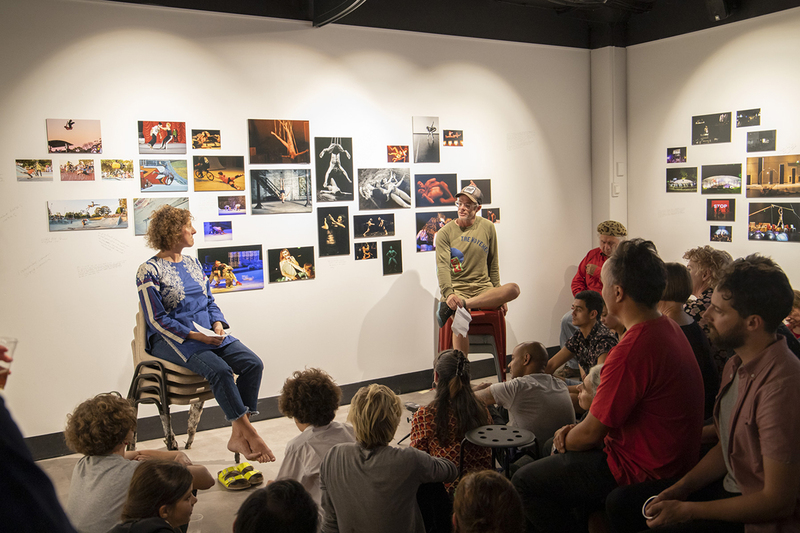 The artists participating in In Response: Dialogues with RealTime each made a presentation talking and performing to the photographs or other images they displayed in their discrete exhibition spaces within the overall UNSW Library Exhibitions Space. 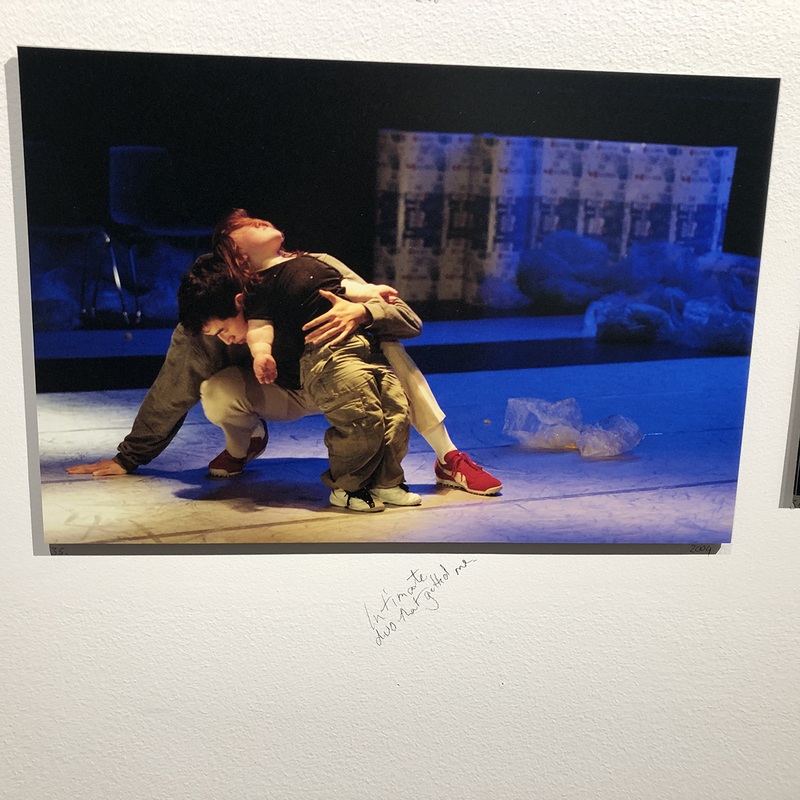 Martin Del Amo commenced his presentation amiably guiding us through the photographs by Heidrun Löhr that have dynamically documented his dance career since 1996. At one point he narrated, while performing, his motivations for a series of movements from a work in which parts of the body moved, counter to expectation, in opposition to each other. The telling took his breath away, and ours. 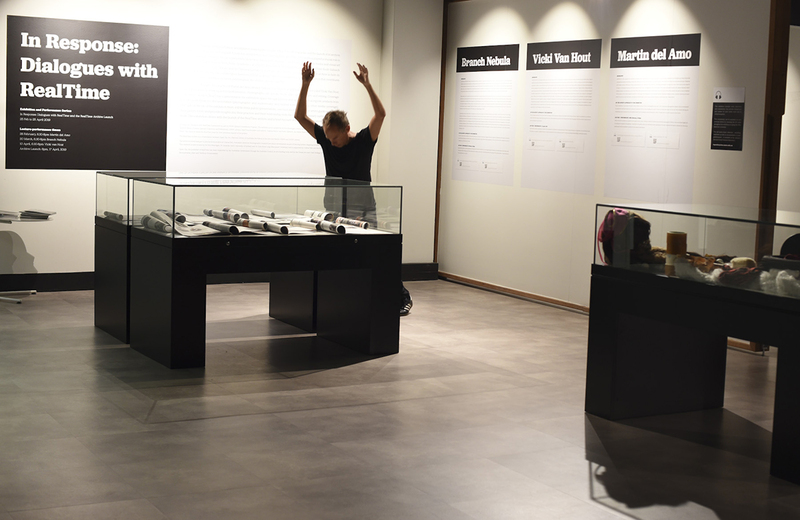 Martin moved into the larger forward space of the gallery with another engrossing performance. You see him here hovering over a vitrine of RealTime magazines folded open to pages where the In Response… artists had been reviewed. Next to each photograph in his exhibition space was commentary on his recollections of the works and his finely tuned responses to RealTime reviews by Keith Gallasch, Pauline Manley, Jan Cornall and Virginia Baxter. The couple then quizzed each other about the joys and tribulations of their joint career and their creative communication and then invited some of their collaborators to speak from the floor about their joint experiences. Expertly produced video projections furthered the sense of this company’s distinctive performance style and design. Mirabelle and Lee thanked RealTime for consistent attention to their work, not least earlier on when mainstream media found it difficult to categorise their practice or confined them to “physical theatre.” Mirabelle recalled that in her home country Belgium, where she and Lee met and worked together, that “anything that moves” was claimed for dance, but not in Australia. Anyone who’s seen Branch Nebula at work knows that there’s a distinct choreographic impulse at work, not least in the company’s skateboard park creations. For her presentation, Vicki Van Hout was joined by Henrietta Baird for a vigorously danced conversational duet from Vicki’s major 2011 work Briwyant, performed here on Vicki’s recreation of the river of playing cards set she’d made for the production. 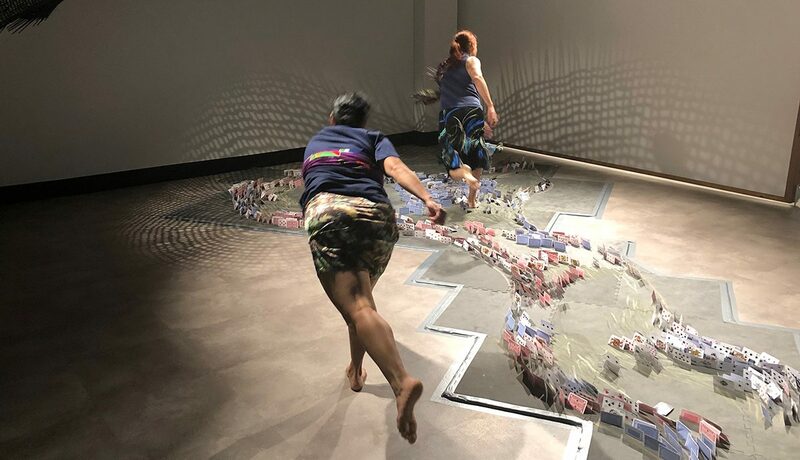 The fast-paced, highly articulated performance was a pleasure to experience in the intimate space beneath a shadowy web cast wide by a suspended hand-woven sculpture, a new version of one made by Vicki for her work plenty serious TALK TALK. Vicki spoke eloquently of how important RealTime reviews had been for her career as artist and also writer. She spoke of how the reviews seemed especially not to speak from outside the experience of the works reviewed. 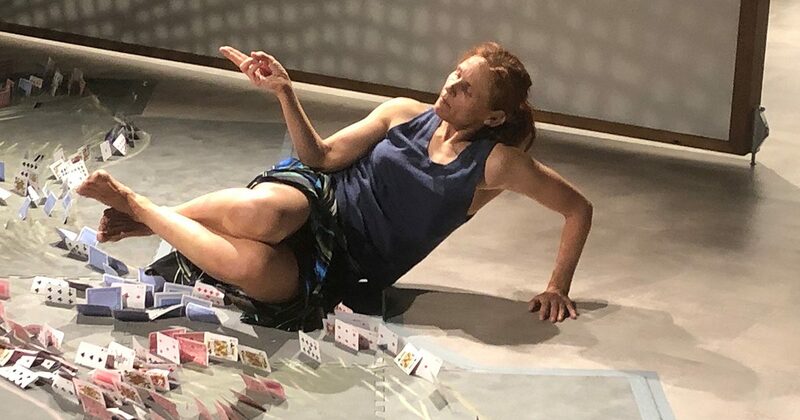 She then invited the audience to meticulously replace the playing cards dislodged or bent by the dancing while telling of the design’s original epic making, her mother’s committed if drolly ironic help with the task, and the meaning of the river the cards.